This system's two-channel performance is excellent, but what about surround? Sony's 2.1-channel solution looks effortlessly classy behind its cool glass fascia. The secret of its slim size lies with the massive S-Master sub that takes care of all the amplification and cabling, leaving just a sleek DVD player and dinky speakers on show. The upright design saves table space and provides easy access to the slot-loading DVD player on one side and USB Host port on the other. The disc-spinner is compatible with most audio and video formats, although not Sony's own Super Audio CD, and the USB port can record as well as play. Unlike the fancy LED displays on some of its rivals, this one is quite calm, with just track info and a clock displayed most of the time. The onscreen display is more impressive, making use of Sony's legendary easy-to-use GUI. A decent remote control helps the F200 win full marks for user-friendliness. Setup is straightforward, with colour-coded cables running to the sub and an HDMI lead to the TV. From this you get pin-sharp pictures from the DVD in standard-def 576p mode and even better results when you upscale to 720p. It'll go all the way to 1080p, in fact, and there's no grain or video noise at all here, just vivid pictures. Put on a CD like Paul Weller's Changing Man and the worryingly slim desktop speakers manage to pull a remarkably broad and descriptive sound out of the bag. The stereo soundstage projects well and is superbly sweet and open in the higher frequencies. It's a similar story with DVD in stereo, too; atmospheric music and crisp dialogue. But the F200 falls ﬂat in surround mode. Sony uses a 'virtual' system to conjure up the illusion of rear speakers, but it doesn't really work. speakers. I soon found myself switching back to stereo mode and being content with the wide two-channel soundstage. It might not manage real 5.1 surround, but there's lots to like about the Sony F200. It's classier than Keira Knightley and just as thin, and CDs sound great. The user interface is slick too, so you'll actually enjoy putting discs in. 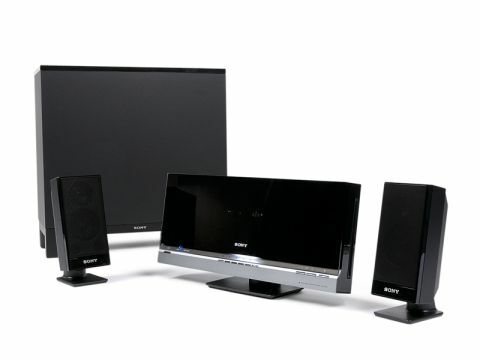 It just doesn't pull off a convincing 5.1 surround soundtrack with its two skinny speakers. It seems you can't have everything.